Oral Cancer Screening - What's Involved and How Does It Work? Oral Cancer Awareness Could Save Your Life! April is Oral Cancer Awareness Month! What a great opportunity to explain the role that our hygienist, Sarah, plays in this important screening. Oral cancer rates continue to rise. People who include smoking and drinking alcohol in their lifestyles are at a higher risk of developing this type of cancer, but oral cancer screening is of benefit to all of our patients at The Gorman Center for Fine Dentistry. Sarah performs oral, head and neck exams at every hygiene visit. It has been reported that only 15-20 percent of dental offices perform these valuable exams. In addition to a visual and tactile exam, Sarah uses a light that enhances visualization of tissue abnormalities. According to a recent study by AAOMS, the American Association of Oral and Maxillofacial Surgeons, oral cancer takes the life of nearly one person every hour. The death rate for this cancer is high because this type of cancer is typically diagnosed late in its development. The ability to recognize it in its earliest stages decreases the severity of treatment as well as the negative long-term effects. Oral cancer is dentistry’s cancer, and therefore our area of responsibility. 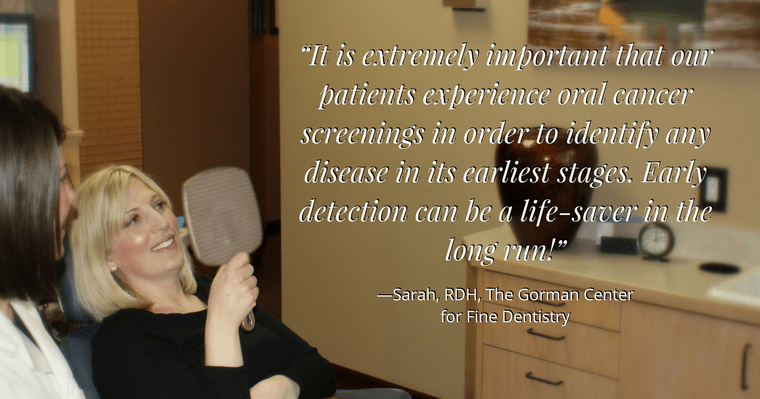 Dental visits at The Gorman Center are more than just cleanings, fillings, and crowns; dental examinations can save lives when they include an oral cancer screening. To be proactive in your own fight against oral cancer, you can take five minutes a month to check your gums, tongue, and lips for any signs. The Oral Cancer Foundation website is dedicated to the cause, including a video about how to self-screen for oral cancer and a written step-by-step guide at www.checkyourmouth.org. As a population, we have found the most success fighting cancers with increased awareness and aggressive campaigns regarding early detection. It has become normal to get a PAP smear annually for cervical cancer, a mammogram to check for breast cancer, and PSA and digital exams for prostate cancer detection. With increased public awareness regarding the importance of detecting cancers in their earliest forms, these efforts for screening have been made possible in combination with education or technologies needed for conducting the exams. 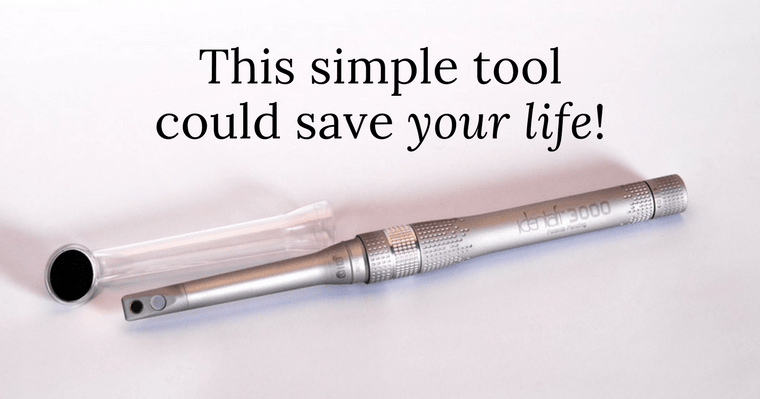 The same should be for oral cancer, for which is actually easier to screen because the procedure does not require an invasive technique. There is no pain or discomfort, and it is inexpensive to be examined. Carry out self-examination and partner with Dr. Gorman to help prevent this disease. Also, spread the word about oral cancer to family and friends of the importance of such heads-up awareness. It can truly be a life-changer!